JOHOR BARU: Operator of KSL Resort Johor Baru, one of Malaysia's biggest city hotels, says there is big potential for the hotel industry here. KSL Resort executive chairman Ku Hwa Seng said the city's average occupancy rate had increased from 68 per cent two years ago to 78 per cent last year. Riding on this, Ku is confident that KSL Resort will be a hit among travellers and businessmen. KSL Resort is having its soft opening today. "Banking on the high occupancy rate, our resort hotel is offering another alternative for tourists and visitors who want a combination of business and leisure during their stay in the city. "This is not only the biggest hotel in Johor, but also the biggest city hotel in the country," Ku told a media briefing at the hotel on Wednesday. The five-star resort hotel, built on top of the KSL Mall in Taman Century, will feature 868 rooms in two face-to-face 20-storey tower blocks. 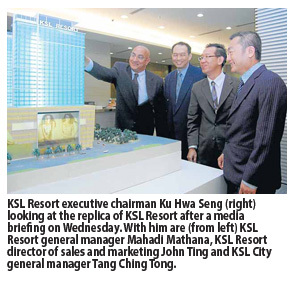 Developed at a cost of RM200 million by KSL Holdings Bhd, the hotel will be fully opened by May 15. Ku said the resort hotel formed part of the RM1 billion development in the area, which also features the shopping mall, which was opened in December 2010, and an exclusive condominium called D' Esplanade Residence, scheduled for opening in the third quarter of this year. It is called a resort hotel as the facilities are more that of a resort than a city hotel. Among the resort facilities coming up at the hotel are a water theme park, electronics golf simulators, a lake-type swimming pool, among others. Of the total rooms, 596 are superior rooms, 239 are deluxe rooms and 33 are suites. The resort hotel also boasts the biggest restaurant seating 560 persons. It will also have a pillarless ballroom on the seventh floor to accomodate up to 1,000 people.